An opportunity to provide a meal for the guests at NBDC. Please sign up for one or more spots below. Food is to be delivered any time between 2PM and 5:30PM. The meals should accommodate approximately 35 people (half children). The meal plan is as follows: Enchiladas (chicken & veggie), green salad, dessert, chips, guacamole, and salsa! Food will need to be delivered to the New Bethlehem Day Center (located in the lower level of the Salt House building) on the day of any time between 2:00 & 5:30 p.m.
You are invited and welcomed to stay and share the meal with the guests, but this is not required. If you are not able to participate this month, keep your eyes open for future opportunities which will be available on this calendar. Enjoy the fun and fellowship of cooking together. Gather at Salt House on a Thursday evening to learn new recipes, have a hands-on experience of making (and eating) food together. Led by Taren Grass. Gather with friends for board games and fun. Some of the most meaningful faith moments can happen in the midst of a good time. Third Saturday of the month at 7pm. Location varies. Sign up for communications about location. Led by Sarah Urie. We are taking the weekend off and practicing Sabbath! Enjoy the Memorial Day weekend with your friends and family. We have two Council seats that are opening up plus positions on the Personnel committee, next year’s Nominating committee and an Audit/finance role that need to be filled. We are currently taking nominations; please click here to submit a name (your own or someone else’s) for any of the positions that are open. On Sunday, April 28, Salt House Treasurer Greg Fenich will be offering a FY19 Q3 Finance Update to the Salt House community during our gathered worship time. We have a high value on transparency and timely communication about our financial progress and encourage you to attend. After worship, you are then invited to attend a budget preview for the upcoming FY20 fiscal year. This will be a great opportunity to interface with the finance team and ask questions about the proposed budget. Salt House is connected to the larger church body of the Evangelical Lutheran Church of America (ELCA). And with our official status as a recognized ELCA congregation, we are expected to participate in the regional rhythms of church governance. The Synod Assembly of the Northwest Washington Synod is May 17-19, and we at Salt House are committed to attending this gathering. So on Sunday, May 5 we will vote for four people from our congregation to attend the Synod Assembly as representatives of Salt House and to serve as voting members on our behalf. This is particularly exciting as we will be electing a new bishop for the Northwest Washington Synod. If you'd like more information on this upcoming event, please click here. Join us on Sunday, May 19 during worship to hear from each of the nominated candidates for the respective leadership positions that are open. Also, hard copies of the final FY20 budget will be made available to the congregation. Join us on Sunday, June 2 at 10:00am for a First Sunday Feast and Annual Meeting to vote for our new leadership members and approve our FY20 budget. Salt House Families gathering is on Saturday, June 8 at 5:30pm. We have scheduled a baptism Sunday on June 9. If you or someone in your family is considering baptism, please let us know. We will schedule a baptism class in the coming weeks based on your availability. Let us know here. Baptism is a traditional Christian sacrament that dates back to the initiation rituals of the early church. And throughout the centuries, there have been many different views on what baptism is for and why it matters. At Salt House we aim to hold the diversity of values on why, when, and how to engage in baptism. But more than anything we hold the love and grace of God as central to this practice. We would love to join you in celebrating this sacrament in community at Salt House. What's up with Easter? Why is it such a big deal? Is Jesus' resurrection miracle, myth, or both? Or maybe the life, death, and resurrection of Jesus points us to a deeper truth about our shared humanity and the goodness of God. Regardless of what you do or don’t believe, you are invited to come and explore Easter (and the wonder of life) with us at Salt House. BUT FIRST…GOOD FRIDAY | Celebrating the reality of the resurrection of Jesus means we also observe the reality of his death…this is the story. Join us for our Good Friday service on April 19 at 8:00pm. BRUNCH | We love to eat together and you’re invited to join us for an Easter Brunch following our meal. It’s a potluck style meal, so feel free to bring something to share, but if you’re visiting Salt House for the first time, there is no pressure to bring anything except yourself and an open heart. FUN | After our worship time, we’ll host an egg hunt for kids. QUESTIONS? | Contact us here if you have any questions. We’re more than happy to help make your time at Salt House on Easter Sunday an easy and affirming experience. SALT HOUSE is a new church in Kirkland. We are a progressive, LGBTQ+ affirming, Lutheran community and we would love to get to know you. We are deeply engaged in meeting the needs of homelessness in our area through the New Bethlehem Day Center. We meet every Sunday at 10:00am. Celebrating the reality of the resurrection of Jesus means we also observe the reality of his death…this is the story that we enter into on Good Friday. Join us for the groundbreaking of the new Eastside Shelter for Women and Families! We are excited to celebrate with you as we break ground on a permanent, year-round 24/7 shelter for women and families experiencing homelessness. Your generosity and the unprecedented support from the Eastside has made this shelter quickly become a reality. Join us for drinks and appetizers followed by a short program at 4:30PM. Sunday is work day at Salt House. Right after worship, we'll work for a fast and focused 90 minutes, so you can be part of caring for our spaces and still have plenty of time to enjoy your spring day. Childcare will be available as well kid-friendly ways to help. We'll weed, move bark, pull ivy, pressure-wash, and more. Wear your grubbies, bring some tools, and we'll see you on Sunday! The meal plan is as follows: LASAGNA DINNER! Bread, Meat & Veggie Lasagna, Green Salad, and Dessert. Join us on Wednesday, March 6 at 7:00pm for our Ash Wednesday service. Ash Wednesday kicks off the season of Lent, a season of journeying with Jesus to the cross. On Ash Wednesday, we'll engage in an immersive experience of our own mortality; a powerful and deeply meaningful time of what it means to live knowing that we are dust...and to dust we shall return. During Lent we continue focusing on the practice and diversity of prayer with a book PRAYER: Forty Days of Practice* by Scott Erickson and Justin McRoberts. Books will be available for pre-order this Sunday for $12 and can be picked up at Salt House. If you want to reserve a copy, connect with Taren Grass. *Prayer: Forty Days of Practice was originally self-published by Justin and Scott in 2016. They’ve revised and updated the book (which is now available with a hard cover) and has been officially published through Penquin Random House. We are thrilled for both Justin and Scott as this beautifully written, timely, and deeply transformative book is reaching people and speaking with a true, encouraging, and practical voice to those who seek to engage in the practice of prayer. Thank you for supporting Troop 41144 at the New Bethlehem Day Center! We use our cookie money to support our program throughout the year. We are so grateful for the generosity of our community! Our cookie booth will be on Mar 6th at Salt House Church at 4 pm. We would love to see you there! If you have questions about this cookie sale, would like to order online or donate cookies, please contact Leah Elsener. Help get the word out - If you're social media (Facebook, Twitter, Instagram) and would be willing to help share about the Scott Erickson event next week, I've put together several resources you can use to do that --> Photos and sample posts. Join us for an exceptionally special experience at Salt House on Sunday morning, March 3 with Scott Erickson. We asked Scott if he’d come and spend some time with us at Salt House on a Sunday morning and said YES! 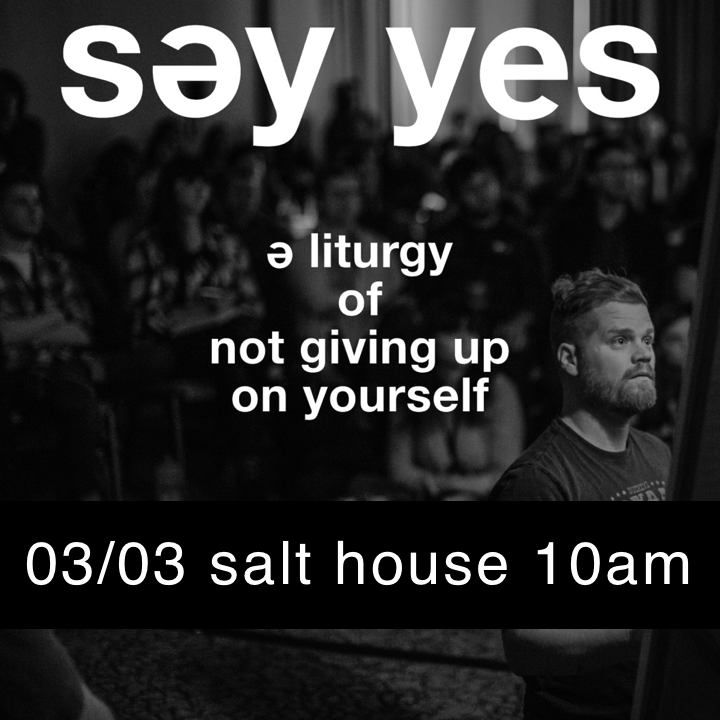 Scott will be sharing his newest piece called SAY YES: A LITURGY OF NOT GIVING UP ON YOURSELF. SAY YES is a multimedia storytelling experience that deals with the painful death of a dream. When your dreams die, the voice of Giving Up speaks very poignantly about what your next options should be. But I discovered a hidden deeper path emerges. one that leads to an unexpected conversation with desire, vocation, and existence itself. “Liturgy” simply mean the “work of the people”…and our conversations about existence, giving up, suicide, disappointment, desires, vocation, hopes, dreams are communal conversations that we should corporately construct before existence itself. And they should involve comedy, singing, and art making. This is what we’ll do together. CHILDCARE for littles and elementary age (please let us know if you need it at https://www.salthousechurch.org/childcare), but kids are more than welcome to join the large group. Expect 75-90 minutes of awesome. A note about PARKING - We have limited space in our lot but here is an abundance of extra parking across the street at Lake Washington High School. Our next SAFE HAVEN TRAININGwill be held on Sunday, Feb. 17 after worship. This is for anyone who is serving a "vulnerable population" at Salt House (kids ministry, care team, etc.). We believe having as many people Safe Haven trained at Salt House helps to ensure a safe community for all people. Please connect with Rachel Horton to enroll in the training. It’s a POTLUCK! Please bring either a MAIN or SIDE dish to share with the community!